McGovern and Sons, L.L.C. was started in 1972 by Bill McGovern Sr., Bill McGovern Jr., and Terry McGovern. The business is currently owned by Bill McGovern Jr., and his son Kory. McGovern & Sons, L.L.C. 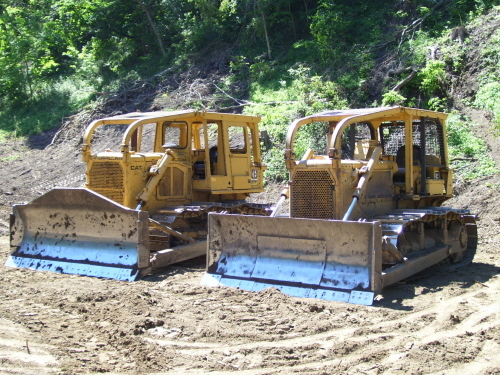 provides site preparation for new building construction, parking lots, roads, driveways, fill material and excavation. They can provide general maintenance and new construction programs including removing silt from all size ditches, building/repairing/maintaining of levees, construction and repair of pump stations, culvert replacement, bridge repair, wood and sheet pile driving. They can survey and design conservation practices such as dry dams, terraces, waterways, ponds and land clearing, including site clearing. They have assisted with cost share projects sponsored by Fish and Wildlife Service, Ducks Unlimited, Dept. of Natural Resources and Natural Resources Conservation Service. Projects include wetland restoration, providing water control habitat areas, lakes, ponds and wet areas. These projects provide areas for hunting water fowl, turkey, deer and all types of upland game.